After a long cold and rainy spring, NEPA is finally experiencing hot summer weather! So, get outdoors and have fun in the sun. However, please be mindful of how your body reacts to high humidity and heat and take appropriate precautions. You don’t have to be running a marathon or playing football in full uniform to suffer from heat stroke. Heat stroke, one of the most serious heat-related illnesses, is the result of long term exposure to the sun to the point which a person cannot sweat enough to lower the body temperature. The elderly and infants are most susceptible and it can be fatal if not managed properly and immediately. Believe it or not, the exact cause of heatstroke is unclear. Prevention is the best treatment because it can strike suddenly and without warning. It can also occur in non athletes at outdoor concerts, outdoor carnivals, or backyard activities. Gradual Acclimatization to Heat – Get used to the heat gradually. Have shorter and less intense workouts or practices for the first 7-10 days. If you have recently had the flu or an illness with a temperature, you are at increased risk for heat stroke. Get rest and gradually introduce activity in the heat and humidity with short periods of exercise. Humidity Index (RI) – Be very aware of the temperature (T) and the relative humidity (RH). RI = T + RH. If the sum of the temperature and relative humidity are greater than or equal to 160, take serious precautions (short workout sessions in am or pm, drink plenty of water and sports drinks etc). If the sum of T and RH are greater than 180, practice and/or games should be canceled. It may be a good day to workout indoors or consider a water sport! Take Frequent Breaks – and exercise in the early morning or evening to avoid the hottest part of the day. Unlimited Cold Water – should be available at all times. Mandatory scheduled water breaks every 15-20 minutes. Take breaks in a shaded area and water down your head, neck etc to cool down. Guidelines: 16 oz 2 hours prior to activity, ½ water bottle every break, after practice continue drinking 1 cup per hour for 4-5 hours, avoid caffeine drinks (can dehydrate), avoid carbonated drinks (bloating will limit water intake) and avoid alcohol. Electrolyte Sports Drinks – are very helpful to replace electrolyte loss. DO NOT USE SALT TABLETS. Generously season food and use sports drinks instead. Dress For Heat – use drytecR type material under your pads to wick sweat away from body and change shirts at break. Wear light colors. Footballers should use fishnet jerseys over pads to keep cool and remove helmets often. Medical Files – trainers and coaches should keep an index of individual athletes with medical problems or history for problems, especially those at risk for heat related problems. Certain medications may put an athlete at risk for heat stroke. Pay special attention to those players. Keep Alert – coaches, parents, players must be on the lookout for signs of a problem in themselves and their teammates such as fatigue, lethargy, inattention, stupor, and loss of coordination. Remove the athlete from the field, cool down in shade with cool (not cold) damp towel/blanket, and seek medical attention. DO NOT IGNORE SIGNS OF PLAYER DISTRESS OR POOR PRACTICE MANAGEMENT – YOU MAY SAVE A LIFE! – If you witness signs of a player in distress or signs of poor practice management that may jeopardize the health of an athlete, diplomatically speak up. Use references to educate those in charge to recognize there mistakes and improve conditions. Problems occur not because of malice, but usually because of ignorance. 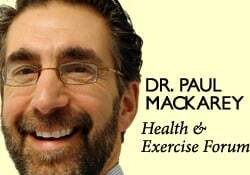 Paul J. Mackarey PT, DHSc, OCS is a Doctor in Health Sciences specializing in orthopaedic and sports physical therapy. Dr. Mackarey is in private practice in downtown Scranton and is an associate professor of clinical medicine at Geisinger Commonwealth School of Medicine.